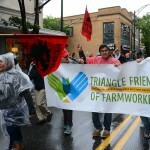 FLOC members and allies took over Winston Salem streets for the eighth time at Reynolds American’s annual shareholders meeting, calling on the company to guarantee freedom of association throughout their supply chain and ensure farmworkers have a safe grievance procedure to voice and remedy complaints. 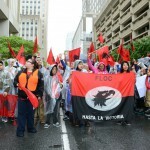 This year, FLOC’s focus was on a recent report of child labor and other serious violations on Reynolds contract farms. Check out this slideshow of pictures from the event! Just one day before the shareholders meeting, Reynolds released its 2015 farm audit report, which evaluates contract farms on compliance with legal standards. The audit found cases of children under 13 working on Reynolds contract farms, minors below age 16 illegally performing hazardous work, serious safety violations, such as improper safety equipment when working in the tobacco barns, and inadequate reporting of workplace accidents. 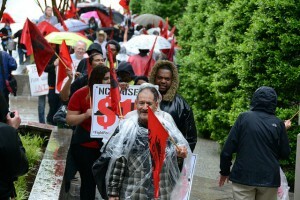 Interviews with workers uncovered wage violations, noted that a percentage of the workers interviewed did not feel they could come and go as they please, and found that 25% of growers were not providing legally required documentation to workers, such as information on wage rates, transportation, and housing. The documentation of these problems, which Reynolds has denied for years, confirms what FLOC has been telling the company since 2007: the tobacco industry is guilty of turning a blind eye to child labor, dangerous working conditions, and many other abuses for far too long. At 9:00am, 40 farmworkers and FLOC supporters went into the Reynolds meeting to talk face to face with company executives about the audit, and the company’s lack of action on labor issues over the past few years. Ten of those who went inside were youth, and most had previously worked in tobacco. For the first time, Reynolds leaders had to listen to the testimonies of the child farmworkers that they claim don’t exist. One of the workers shared his story of having to work in tobacco fields during the summers after watching his single mom struggle to pay the bills and support him and his brother. “Will you sign an agreement with FLOC that will guarantee a living wage, so that children don’t have to work in the fields to help support their families?” he challenged Reynolds’ leaders. Stunned by his emotional testimony, no one answered his question. There is no doubt that increased focus on auditing and addressing these issues is a result of pressure from FLOC and allies. Inside the shareholders meeting, CEO Susan Cameron focused a large part her remarks on FLOC and labor issues. However, the company continues to try to sweep labor issues under the rug, and even went so far as to say that the fact that they found only a few cases of child labor in the fields means that the audits are working. FLOC President Velasquez says he thought the meeting went well, and that he sees Reynolds shifting their strategy and beginning to acknowledge that problems do exist on their farms. “I was encouraged by the fact that Cameron’s report finally addressed the long avoided issue of Freedom of Association. While it signaled a seismic shift in the company’s public response to our concerns, we still have to be guarded because of their tendency to push for cosmetic remedies, like increased trainings, over solving fundamental inequalities.” Said Velasquez. 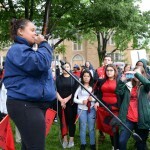 Reynolds heard us loud and clear: There are more than a few children working in tobacco fields across the South, and the information from the small sample of workers that they spoke to in the audit only provides a brief glimpse into the harsh realities that farmworkers face in the fields each day. Little by little these stories and truths are coming into the spotlight, and Reynolds is being forced to confront the reality in the fields and recognizing that working with FLOC is necessary ensure that farmworkers’ basic human rights are protected. 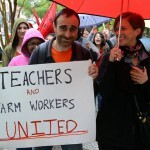 Many thanks to all of you who marched side by side with us in the cold, windy rain! Thanks to the National Farmworker Ministry, YAYA, Fight for 15, Black Workers for Justice, Working America, NC AFL-CIO, NC Field, Duke Cakalak Thunder, Duke Divinity ethics class, Factulty Forward NC, HOLA, and all of the members and supporters who rode the bus all the way from Ohio to be here for this event. Each year we see more progress, and we won’t stop fighting until we see an end to human rights abuses in tobacco fields.